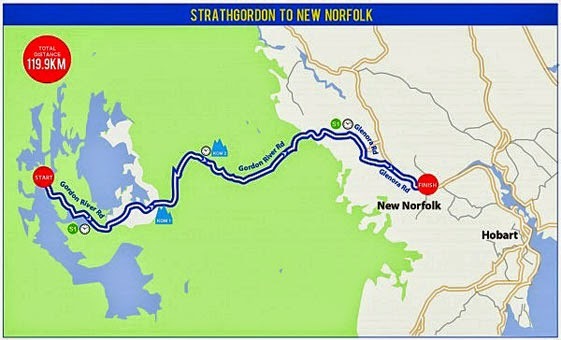 SCANT information has been provided, but Stage 2 of this year's cycling Tour of Tasmania will be conducted over a 120km course from Strathgordon to New Norfolk today. The road race will start at 10.30am at the Lake Pedder Chalet, with an approximate finishing time of 1.45pm at Arthur Square (Pioneer Avenue) in New Norfolk. Along the way the peloton will pass through Maydena, Fitzgerald, Tyenna, National Park, Westerway, Glenora and Plenty. The day will present a challenge for tired legs as the 119 riders race through dramatic scenery from the banks of Lake Pedder to downtown New Norfolk. The Tour of Tasmania is a six day event that started in Hobart yesterday and concludes in Devonport this Sunday.